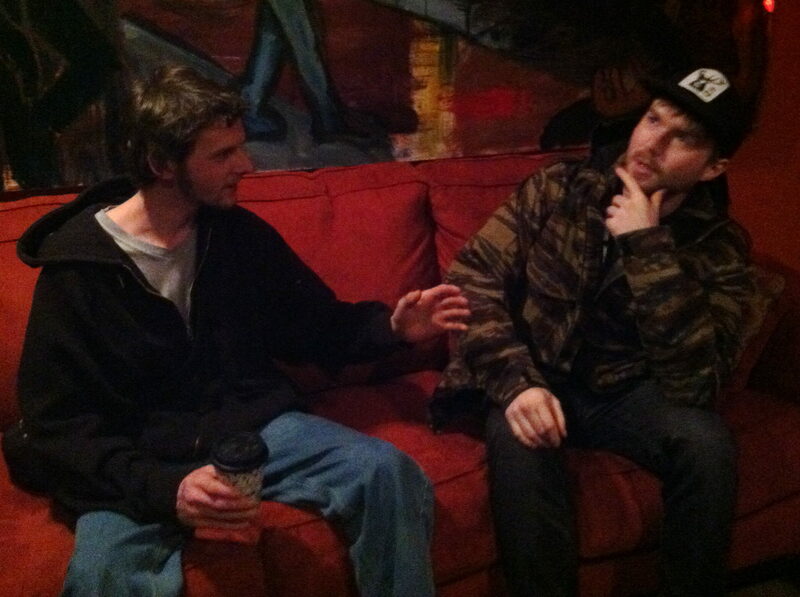 As fortune would have, Doug Appling, a man most know as Emancipator, had a few moments to spare for me before his set at Higher Ground Ballroom in Burlington this Friday. He took the time to sit down with ElectroJams in order to discuss his productions and intergrating them into a live band set-up, The Emancipator Ensemble, for his current tour. Check out our interchange, in its entirety. ElectroJams- So, I’d like to start talking about the tour. The Emancipator Ensemble is something new. You’ve been using live violin in your shows for some time now, but never a full band. How did the “live” expansion come about? Doug Appling- I wanted to evolve the show that I’m touring with, and besides, I thought about doing this in the first place. There are so many sounds involved in my productions based on live instruments, so the band is really a more honest representation of what some of these tracks are. I wanted to bring things into life a bit more, for the live setting. EJ- And the musicians tonight, how did you come in contact with them? Did you know them personally? DA- Well, I knew Colby, the drummer, personally, through the music scene, I met him at a few festivals. Uh, and Peter, through the grapevine, a friend who knew I was looking for a bassist. We had a few auditions… I didn’t really put the word out that I was trying to start a band. It all came about through those few connections. EJ- And Ilya, the violinist, you have a long standing relationship? DA- Yeah, we’ve been playing shows for five years together, so he’s definitely an integral part of the Emancipator show, for sure. EJ- Was he part of any of your original compositions? DA- I hooked up with Ilya in between Safe in Steep Cliffs, and Dusk to Dawn: his violin is featured on a lot of tracks from that album. We got in the studio, and he wrote a lot of those string parts actually, I just produced them. So he’s been a recent addition to the productions, just on that last album. EJ- Was he the first external influence on your compositions? Or were other musicians featured on Soon it Will Be Cold Enough and Safe in the Steep Cliffs? DA- Safe in the Steep Cliffs had a few guest artists, I recorded some strings with a violin player from Portland, some viola, on songs like “Old Devil.” “Ares” features some Mandocaster laid down by a friend… generally speaking though, the first album was all me, composition-wise, using one-shots, building tracks note by note. The second album, I started diving into the world of samples and sound processing, and the third, Dusk To Dawn, there’s a clear change in that I opened up to a lot of collaborations and guest artists on that album. EJ- So with the band, are you out playing the old catalog? Any new tracks you composed together? DA- The set-list stretches back to the oldest songs, and you know, its funny in that… a lot of the oldest songs are best suited to the sound of the new band. I’m doing a lot off Soon It Will Be Cold Enough. We are playing some new tracks though. EJ- Now, your music has been labeled with all across the board: downtempo, trip-hop, but none of that really tells us anything specific about your production style. How would you describe what you do when you come at a track? DA- My productions style… My tracks are very layered, kind of groove-oriented, but also atmospheric. I focus on melodies, and try to make sure a song has something you can take away from it, that resounds in your memory even when you’re not listening to it. I try to combine. I take aspects of different genres, and make a melting pot on the track. I mean, new age music, its all textural, ambient, and atmospheric. I mean, that sounds cool, but to me, it doesn’t have a beat. I found a lot of awesome beats in hip-hop that lacked a little melody and atmosphere, and combined it all into one. EJ- From my angle, its like you’re using nicer sound to trick people into getting down with gutter hip-hop beats, these loops we’ve been hearing since the early nineties. I can’t help myself. I love it. DA- No, totally. I love hearing weird juxtapositions of music like that. You know, like a classical guitar sample, with an electronic kick drum, and some hip-hop sample all rolled into one. All my favorite things. There was a Simpsons episode I saw when I was really young… the one where Homer joins the circus because he can take the cannonballs? There was some clip from that episode where the London Symphony Orchestra is playing, and Cypress Hill is rapping over it… that’s always been ingrained in my memory as such a dope combination of sound. EJ- No, definitely. So do you begin with beats? I know you started some time ago, before all the fancy new programs were out. Were you always using the computer? DA- I started on Acid Pro, I had folders of kick drums, snares… I just went through and picked things, sound by sound, then later I’d get into chopping up breaks, taking little snippets and weaving it all together like collage style to get my drums. At the same time though, I’m still always working with some other sound, some sort of melodic layer. I need both to kind of inspire me. I’ll either pick out a sample, or record a little chord progression on guitar, and then pick out the drum sounds that really complement at least one layer of the music. EJ- Nice. Now, while your compositions are in themselves unique, I’d still say I do see another guy in your “field”, if you want to call it that, Bonobo. DA- Bonobo is definitely one of my favorite producers. It’s been very cool to see his style evolve from trip-hop into more “electronic” music where it is today, and yet he still stays true to his original sound. Definitely a big influence. EJ- Any other influences? People you wouldn’t go without mentioning? DA- Instrumental hip-hop, you know, RJD2, and DJ Shadow, but also the loungier side of things too, Thievery Corporation, and of course, Bonobo, that’s what I was listening to when I first started making beats. I was also coming out of a rock and roll phase. In high school I played drums in a band; we were listening to Fugazi and the Pixies, that’s a big part, so is techno, and the Mortal Kombat soundtrack. EJ- All over the place. DA- I also grew up playing violin, so classical music was a big part of my musical education. EJ- That’s quite the Emancipator collision. Classical training and electronic production, seems like it wouldn’t be such an easy transition. DA- You’d be surprised, even recently, over the last few years, I’ve witnessed a lot of really amazing, classically trained musicians get into electronic musical production. They learn it all so quickly. I see them, and I’m like, wow, they’re about to start killing it. I think that injecting classically trained composers with electronic production skill is really going to take things to the next level. EJ- I totally agree, I mean, the possibilities with the new programs are boundless. DA- Absolutely, It’s not like in the past where there was a division like, “Oh, I can’t play an instrument, so I’ll just get on the beat pads or into computer programs.” You can be so musical with a computer and musical technology these days. EJ- No limits. Doug, it’s been wonderful. Thanks. The Emancipator Ensemble will be touring North America for the remainder of Spring and into the Summer Festival season. For more information on the band, and to see a complete list of tour dates, check out their homepage.